I usually don’t look twice at quilt tops in thrift stores (I have enough of my own to be finished!) but this was so bright and beautiful. Plus the price was….wait for it….$3.99!!!! I almost feel bad someone went to all this work and it was under 4 bucks! Whoever made this was a quilter after my own heart adding in a hefty amount of solids. Further proof that solids never go out of style. Have a great week! I am so glad you brought it, it has a home now. Can't believe you got that for under 4$! Congrats! How do you plan to quilt it? Beautiful….I have one not pieced very well, that I use for a tree skirt around my Christmas tree…but I bet you have big plans to machine quilt. Have fun! That is an awesome find! How exciting! Congrats on that excellent find; and so cheap too !~! I love the solids in a nine-patch, the way they set off the prints just amazes me. Thanks for sharing. Wow, that is beautiful. Great find. I've looked for quilts at thrift stores and never find any. You got lucky. I know, I quilt maker spent a lot of time on this lovely quilt and the thrift store feels it's only worth $3.99. 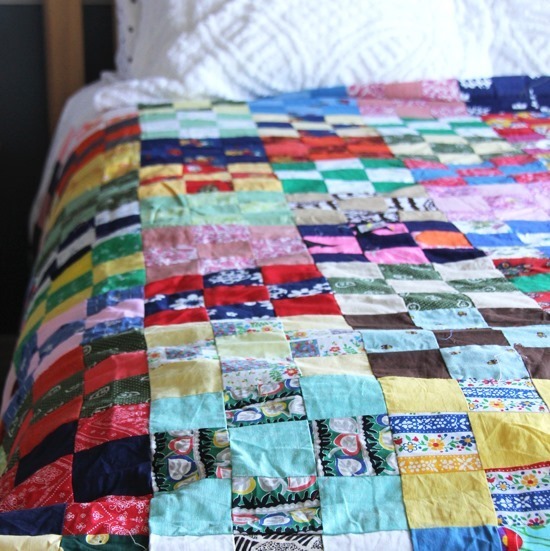 I once found one of my early quilts, that I'd spent months hand quilting, in an antique shop for $15. I left it there (it had a horrible batting that insisted on migrating through the top and back). Nothing like your $3.99 bargain, which makes me really, really want to interview the person who made it! What an amazing find … good for you! Wow! That is very nice! Who ever made it would be thrilled to know that you have it and will love it. Such an extremely lucky find! I'm jealous. 9 patch is still my favorite. What a deal and yes, on white it would look fantastic. All those hours of sewing and it ended up in a resale shop. I guess some people just don't understand what to do with an item like this. That is a good "find". It will be a wonderful quilt! Very glad you found it and gave this lovely quilt the good home it deserves. Enjoy finishing it and using it. what a amazing find, I expect most of my stitching will end up in a charity shop when I have gone! Wow! What a find! It makes you wonder about the creator, how did it end up in a thrift store? Glad it will be used and loved. What a bargain! Whoever made it will be pleased it has gone to a good home. Thats amazing find! If only it could talk and tell the story of how it got there. It's actually pretty nice. 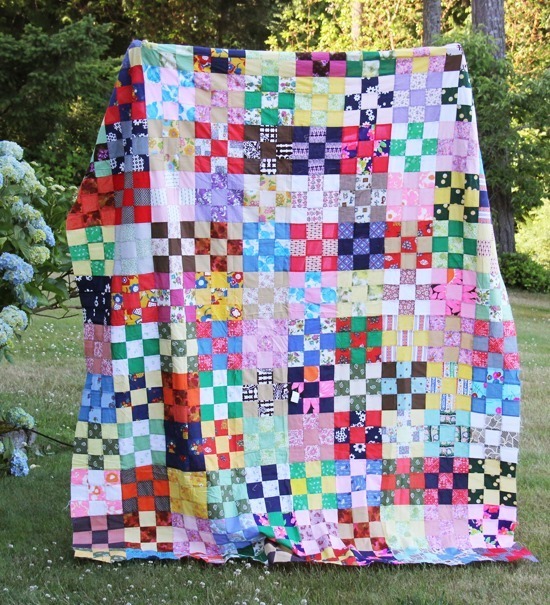 I have seen some really ugly quilts in thrift stores :) I also wonder if all the ones I have given away to family might eventually end up at the salvos lol. What a lovely quilt. So bright and cheerful. I can't believe they sold it for $4. What a treasure! It looks beautiful. congrats on your find. Congrats also on giving this wonderful piece a new chance on life. wow. I'm with you, I have enough quilts to quilt without taking on someone else's. But $3.99 yes, I'd have to go for it too! Great steal! How lucky to come across such an awesome bargain! Wow-I love it! Can't wait to see it finished. I think I'll make one like that with all my fat quarters. I always wonder about the story behind such a find. Was someone not able to finish it and, if so, why? Were they just tired of looking at it having gotten it that far? Was this the result of family clearing out a house and not appreciating what they were giving away? Certainly the thrift store didn't know what they had their hands on – $3.99!?! It was definitely your gain but I wonder whose loss. That's pretty crazy! Beautiful top! 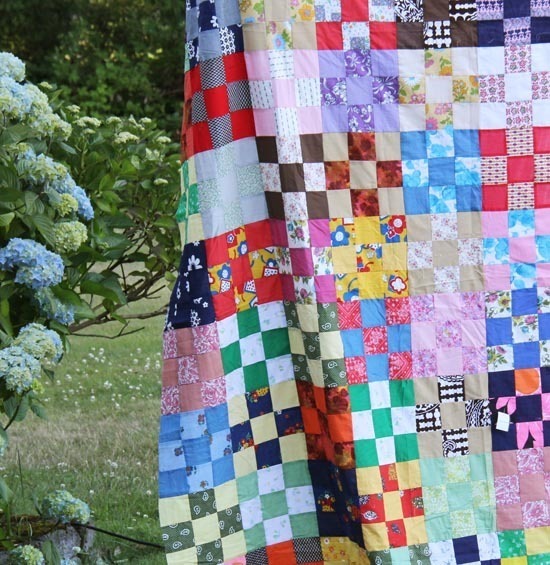 I made a quilt like that, except it think my 9 patches were smaller – I used 2" squares – from all scraps. I hand pieced the whole thing, and it took me years. I just made the 9 patches as I collected the scraps, and eventually I had enough. I'd never sell it – certainly not for $4.00! Enjoy it! I'm glad that old quilt top has found such a good home. What a STEAL! That is glorious! You just inspired me to go to the thrift store down the street from me… makes me hope that I am just as lucky as you are with your find! Way to go! Can't wait to see it finished! What a great score! What kind of thrift store sells quilt tops? They would be great for FMQ practice, you know? I agree, that 9 patch is totally your style. Lucky you!!! Just last week, I visited a shop that had advertised piles of quilt tops. Too bad they were all priced at $39 and none were even worth that! They were poorly made and not worth the money or the effort to finish them. So I'll say it again – lucky you! This is gorgeous and a great find! Gostei muito! Parabéns , uma verdadeira colcha de retalhos! I simply love your vintage patch. Also I use to sew, knit…. What a great find good for the person that made it that you bought it and appreciate it. Beautiful, colourful quilt. A great find! Great find and I do like all the colors. Glad it has found a new home.